Woodpeckers are a benefit to the landscape and can be a pest in the landscape, as with many of our “Dirty Dozen” songbirds. We will help you make sure they do not become a pest, while giving the information you need to make sure they are part of your healthy ecosystem. Woodpeckers nest in deep cavities in dead or dying trees that they hollow out with their bills, laying 4 to 8 white eggs on soft wood chip debris from the excavation project. While many have ranges limited to specific regions of the country, downy and hairy woodpeckers and northern flickers are at home just about everywhere. Woodpeckers typically live from 4 to 10 years. The smallest of all the woodpeckers in North America at 7 inches long, downy woodpeckers are the least timid of all. They are the most common woodpecker in the East and parts of the West. They have white backs, white-spotted black wings, and barred outer tail feathers. Males have a solid red spot on the back of their heads. Their bills are short, considerably smaller relative to their head size than those of hairy woodpeckers, which they resemble. They harvest insects from just underneath tree bark, frequenting wooded areas such as suburban yards, city parks, orchards, bottomlands and small woodlots. They prefer deciduous trees that lose their leaves every fall to evergreen, coniferous trees. 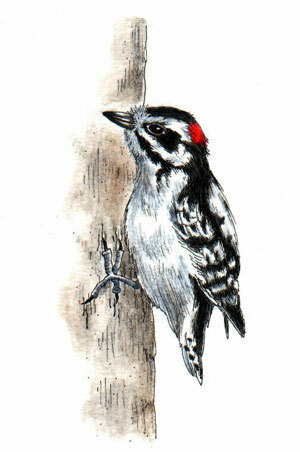 Hairy woodpeckers are larger versions of downy woodpeckers, measuring 9 inches or more. They have white backs and underparts, white-spotted black wings and black tails with white outer feathers. Males also have a red spot on the backs of their heads, but it is divided. Their bills are longer than those of downy woodpeckers. They are able to penetrate wood more deeply, leaving obvious holes in tree trunks where they have been at work. More bashful than downies, they tend to linger in their favorite deciduous and coniferous woodlands, wooded swamps, river bottoms and mountain forests rather than visit backyards routinely. Northern flicker is now the name of all of those birds formerly labeled yellow-shafted, red-shafted and gilded flickers. They are basically the same bird, but have regional color differences. Measuring 13 to 14 inches long, they sport black bars on brown backs, a spot of red on the back of their necks, a black crescent on their breasts and white rumps. Easterners also flash golden yellow under their wings and tail, while westerners have red in those places. Eastern males have black mustaches and western males have red mustaches. The flicker call is a distinctive, repetitive wicker, wicker, wicker. 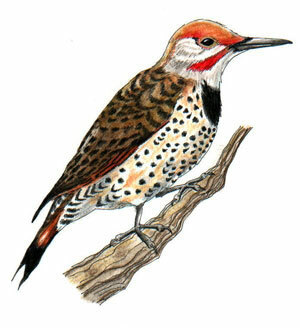 Flickers will migrate southward when the weather turns uncomfortably cold. During the warm season they reside in open country such as farms and orchards, parks, cemeteries and suburbs. Unlike most woodpeckers, flickers feed on ants on the ground.